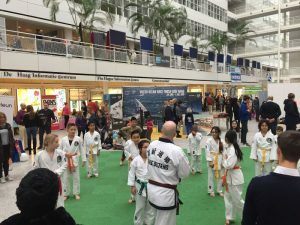 The theme of the 2018 Feel at Home Fair was Sport, Leisure & Wellness: well over 4000 visitors were invited to “Be good sports” and participate in a multitude of sports and leisure activities presented by more than 150 exhibitors, performers and animators from the Hague region. Here you can see some photos, taken throughout the Fair, which show the warmth and good spirit shared by visitors and stand-holders. 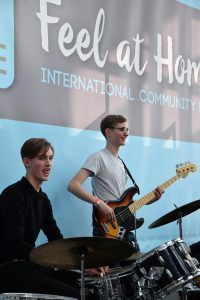 As they entered The Hague’s City Hall, visitors were welcomed with enthusiastic music and dance performances from the international schools and many local club, church, amateur and professional artists. 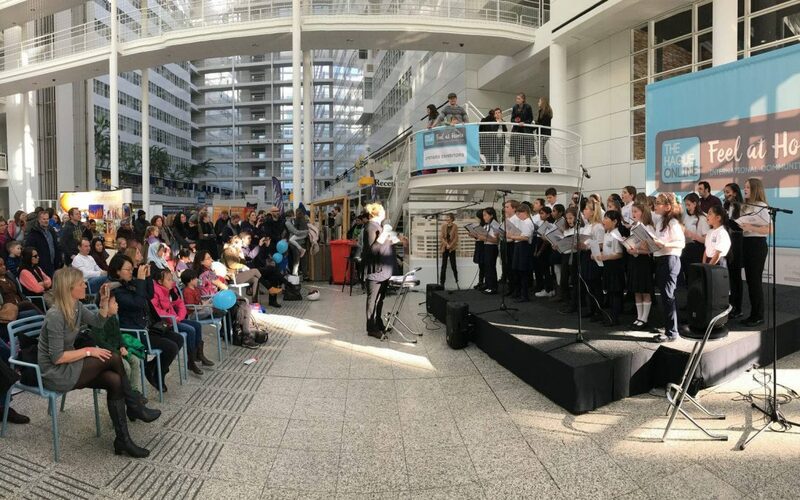 Here is just a glimpse of the entertainment provided among others by The International School of The Hague (ISH), Musiekacademie Den Haag’s Bikkelband and Zahara Academy. On Central Park, visitors were invited to take part themselves in a Bollywood dance and an Irish Ceili, or learn master some moves with The Hague’s Latin Dance Xperience. Those preferring a bit more competition could take hockey, tennis, fitness and sailing challenges, or join in with clinics for cricket, judo and Tang Soo Do. 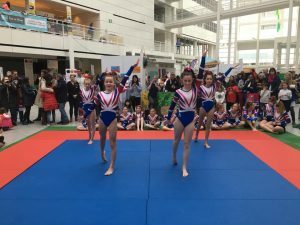 Others simply watched and admired the graceful gymnasts from The British School in The Netherlands. This activity on Central Park set the tone for a wholly interactive experience, as visitors moving through the main hall met with a diverse selection of stand-holders, distributed over two floors of the enormous atrium. The atmosphere in the so-called “ice palace” was noticeably warm, with exhibitors appreciating the high levels of engagement of visitors, and visitors remarking on the energy and sincerity of the stand-holders. On the balcony of the international food court, visitors relaxed while sampling African, Indonesian and Indian cuisine and enjoying a bird’s eye view over the activities below. Afterwards they could pick their way through the crowded stands of theatre groups, photography clubs, charities and cultural associations to the Sports Hall, where they were met by the enthusiastic members of dozens of local sports and leisure clubs. Whilst there, they could sup a pint of Guinness at O’Casey’s Irish Bar or take the tennis service challenge, thereby contributing valuable funds to the Krajicek Foundation’s playground projects, not to mention having the chance to win tickets for the ABN AMRO World Tennis Tournament in Rotterdam next week. A stroll past the eclectic shopkeepers on a mini version of The Hague’s Molenstraat, took visitors back to the School Plein. While the children amused themselves playing badminton or joining in judo and dance classes, their parents chatted with representatives from the international schools and childcare providers, gathered around the playground. Those seeking a more vigorous workout were invited to Decathlon’s Gym where local sport coaches put them through their paces at some unusual exercise stations. Whilst visitors preferring a more cerebral work-out could join in an altogether different kind of workshop on mindfulness, entrepreneurship or public speaking. Judging by the smiling faces and general hub-bub of animated conversation, visitors were enjoying this chance to meet with like-minded internationals. Many said how impressed they were with the huge array of clubs and associations. It seems there was something for everyone to “Feel at Home” at the Fair.